Just so you know, we've been in business since 1985, we aren't a "start up", we are ultraviolet experts that have shipped a couple million lamps over the years. This is why we guarantee results. All UV lamps are not the same, just as not all growers produce the same quality. It has been known for decades that UVB boosts THC yields, even before indoor gardening really took hold. There is still some unfounded skepticism in the grower community, but the science is clear. This is why we give you a money back guarantee on ALL our lamps. We know they will work, and we know you will keep using them once you try them. Most of our sales are repeat customers, and for good reason. 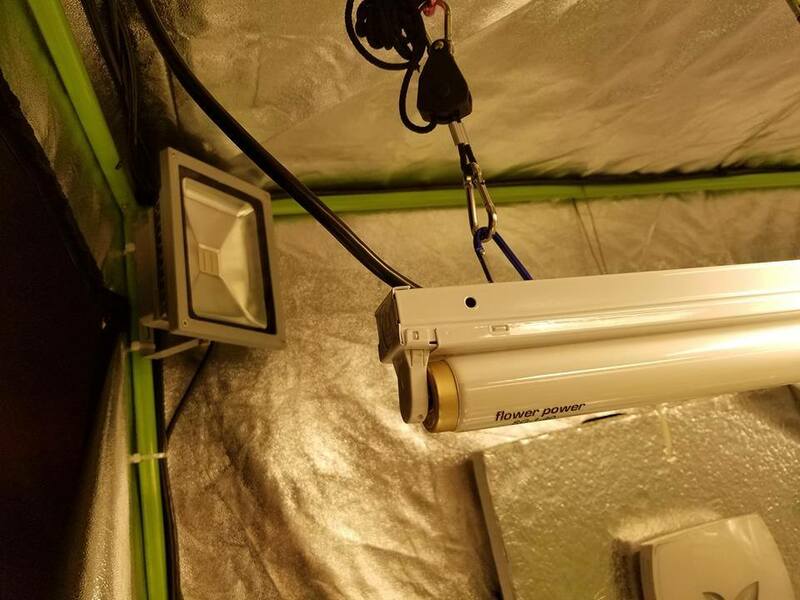 Our lamps are20x stronger than reptile bulbs, and produce high levels of the full UVB spectrum, 280-320nm, not just 300nm-320nm like every other bulb Only Flower Power produces high levels of 280-300nm UVB. You can see the spectrum yourself on the lamp page. This might not seem like a big deal to those unfamiliar, but the most important trigger for cannabis is the UVR8 protein, a protein common to many plants and acts as a chemical messenger to tell the plant it is in high UVB and should react accordingly. In the case of cannabis, this means to jump up protection of THC, which the plant uses as sun block. We have worked with universities, experts and growers nationwide to produce solutions for increasing flavonoids and resins in a variety of plants, from tomatoes, peppers, ornamental plants, and of course, for cannabis. Flower Power was the first and is the only UVB lamps designed specifically for your needs. It does more than boost THC. Here are some of the proven benefits of using Flower Power. * Boost THC - minimum of 15% and many report over 30% increases in net THC. * Suppress powdery mildew - The full spectrum kills many molds and mildews and will prevent breakouts. Only Flower Power has a 100% UVB spectrum. * Suppress insects - The ultra high output UVA destroys their DNA and they will avoid any environment with it. * Kill airborne bacteria and spores - UV is used in hospitals, restaurants and other businesses to do just this, and the Flower Power dwarfs them in power. 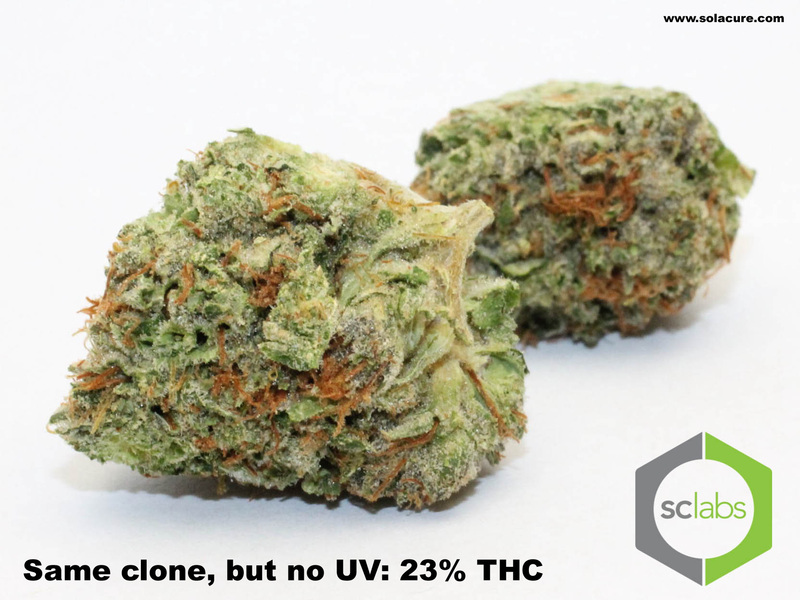 * Works with all strains - Indica strains can tolerate higher levels of UV than sativa. They evolved in higher mountain areas where it was cooler, but where UV levels were much higher. Flower Power is more than strong enough for all strains, and you control the amount given by the number of hours per day they are exposed. * Safer to work with - Flower Power bulbs are so strong, you only need to run them 2 to 6 hours to day in most situations. This means it is easy to set them up to run when no human is around. Of course, if you have to work around them, you just use any wrap around sunglasses that block 100% UVA+B. Working around them for an hour exposes you to less UV than a couple hours of gardening or fishing. This is much better than UV lamps that must be run 12 hours a day. * Built in reflector - Because the reflector is INSIDE the bulb, you don't need to even think about it. In fact, you can easily aim the UV by rotating the fixture a bit. This makes them 50% stronger than the same lamp would be without the built in reflector, as the internal reflector is much more efficient. * Other benefits - If you start from day one of flowering, you will find the plants grow less tall during flowering, they get less leggy. This is because the plant is shifting resources and spending its energy producing denser buds, more trichomes and more THC instead of more stems. If used all flowering season long, Flower Power will give you at least three flowering seasons of 2 months long, so they can be used up to 1400 hours. Keep in mind, they will continue to glow after this, but the UVB will be below 70% of original power at this point. 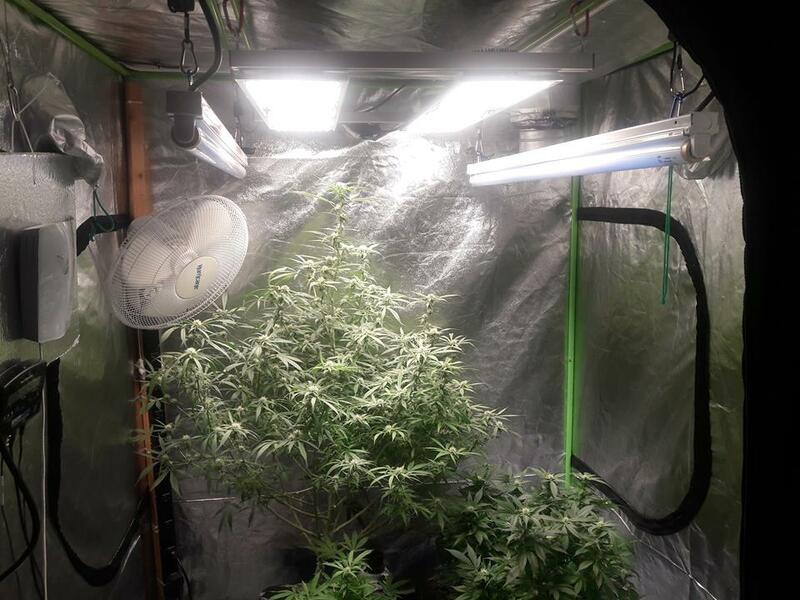 In fact, many growers will repurpose their used Flower Power lamps by running them in their veg rooms for two hours a day. They still will have around 50% of the original UVB (which is still 10x stronger than a reptile lamp) and the UVA will not be affected nearly as much. This gives them the sterilization benefits as well as helping to boost trichome production, and harden the plants for flowering. Very little. The F32 fixtures we sell use 21 watts per bulb and you typically only run them 2-6 hours per day. They are in fact 8x stronger than our leading competitor's lamps (so you use them fewer hours and they work better) while drawing a fraction of the power the competitor's lamps use. No UVB bulb is more efficient. Start on day one of flowering (or sooner) for maximum benefit. This will change the "mode" of the plant from growth to defense. This will not harm the number or weight of buds, although it is known to make the buds denser. Using them only for a few weeks at the end will boost THC but you miss out on the other benefits and your THC will not be as high as if you use them all flowering season. You want to use the Flower Power lamp. This is a 4th generation lamp, and 12 years in the making. The Flower Power is 4 foot long, 1.5" in diameter, and can be used in any 4 foot long, 32 watt (or 40 watt) single bulb fixture. You need two of these lamps for every 1000w hood you have. The first time you use them, start at two hours per day, adding 15 minutes every other day. Once you see the top leaves wilt a small amount, pull back 30 minutes and lock that time in. 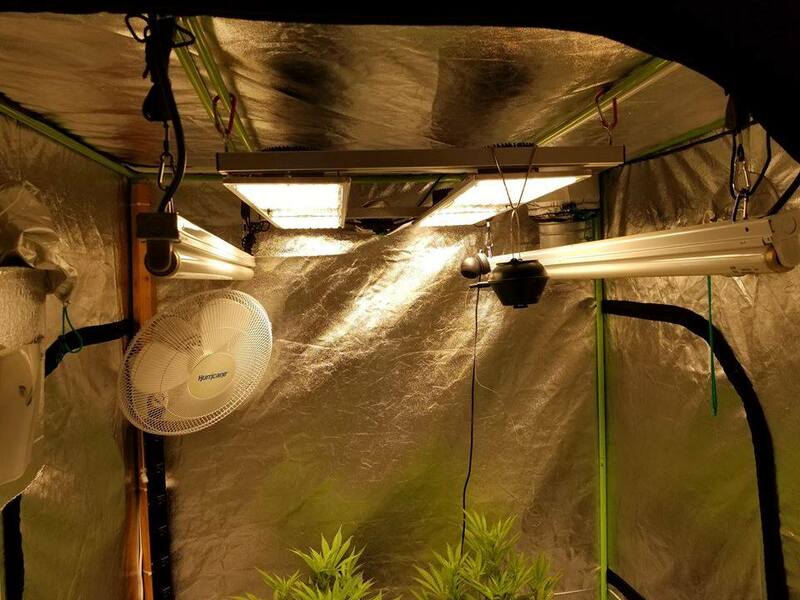 Most people run the bulbs even with the general lighting, around 12 to 24 inches from the canopy. They can be used as close as 6 inches (reduce time) or as far away as 6 foot (increase power and time). If you have an unusual situation, just call and we can give you basics to start with. The lamps can be run in a single continuous cycle, say 4 hours in a row, or you can split it up into two sessions. Some people like to pulse them, running them 10-15 minutes every hour. The extra power makes them very flexible. All tests have shown CBD to remain the same or increase a very small, insignificant amount. They show radical increases in THC production. Flower Power lamps can used in close quarters if you stay at least 6 inches away. It isn't any different than growing in large rooms, except you will probably be running fewer hours due to the distance typically being shorter. A 4x4 tent can use one or two bulbs. 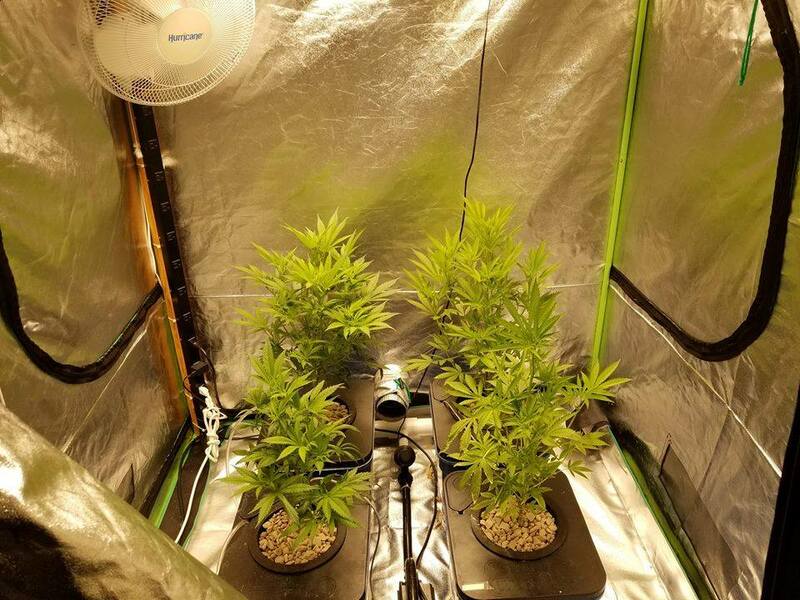 Two is best for plants, one is adequate for scrogging if you aim it at the center of the mix. 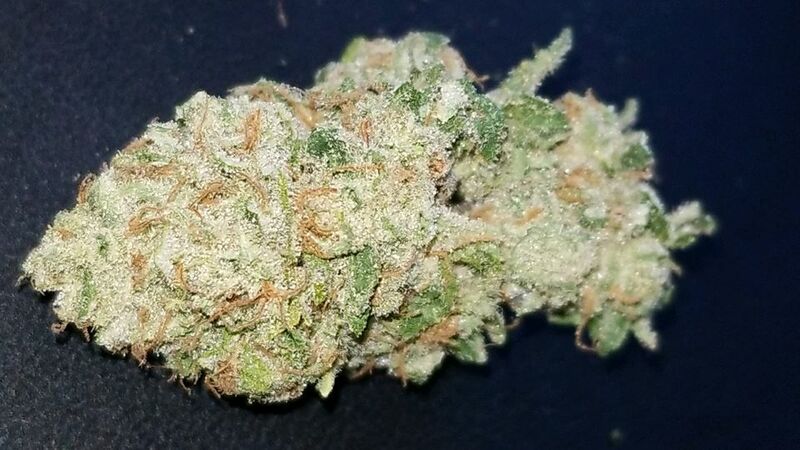 The image below was taken by Walter P. Haze, after his first time working with the Flower Power in a small tent, growing a few different strains. I would say the results speak for themselves. Walter started his plants at 4 hours per day, then worked up to a schedule of 3 hours in the morning and 3 hours in the evening for a total of 6 hours. There is some logic to running this way, giving the plants some rest time between exposures. The Flower Power lamp was designed from day one to be able to be used in Very High Output (VHO) situations for greenhouse growers. They can be run at any height in the greenhouse, and powered from 20 to 100 watts. 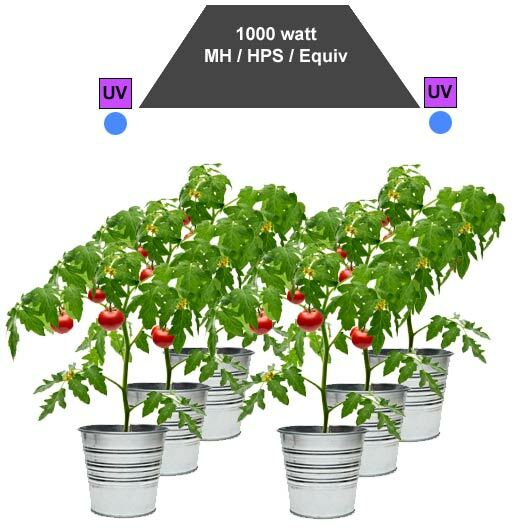 If you are running them up high and at high power, they function as a broadcast light in this respect, and it holds true for tomatoes, peppers, cannabis, or whatever you grow. Many people don't realize that the glass and plastics used in greenhouses actually block all the UVB and most of the UVA. 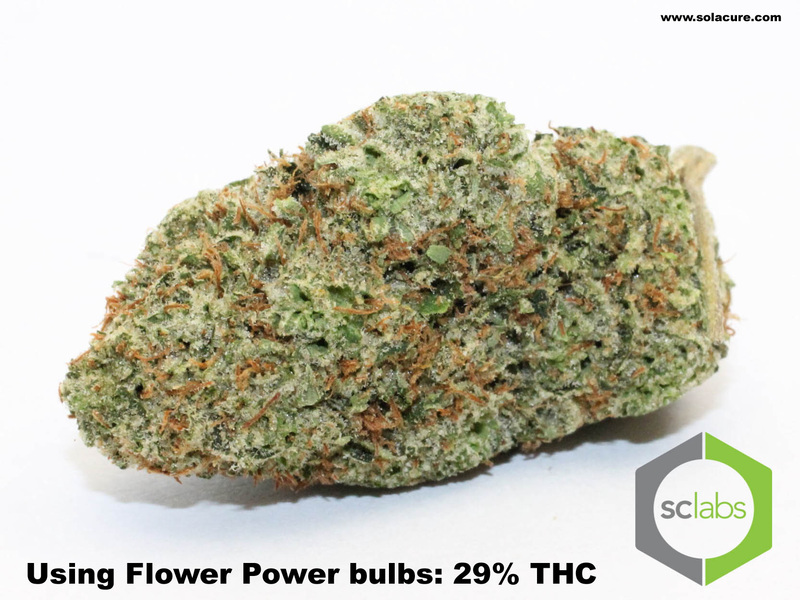 Using the Flower Power puts it back restoring the natural balance in the plant, making it create more flavanoids, turpines and/or THC in a natural way. Call us for a consultation. We've done this before. Do any light makers use your lamps in their fixtures? They don't work to our standards. We've prototyped them using two different engineering teams and built them at two different factories: they simply don't measure up due to the limits of the lamp size. This doesn't mean we never will, but our current lamps are 20 to 50 times stronger than the prototypes. It is a matter of physics, not effort or experience. The skinny lamps are fine for general lighting but creating UVB requires much higher energy levels and surface area on the lamp. In short, T12s glass works much, much better, so that is what we will use. Quality, power, spectrum and results is what we are focused on. We aren't so focused on how pretty the lamp is. Flower Power bulbs are designed to run at 21 watts, or up to 100 watts. You decide based on your needs. Nothing has a better spectrum. Nothing has a fraction of the output from 280nm-300nm, the most critical area for triggering the UVR8 protein. Nothing can touch them for total power (not even close), plus they last at least twice as long as a standard lamp. They are the world's first dedicated horticulture bulb, a 4th generation design that had cannabis cultivation first and foremost in mind when we engineered it.